I actually did EDM Challenge #129 before this one. I walked around and around the apartment looking for a view that I felt like drawing. Some views were boring, some too challenging, some not blog material (bathrooms). This is the view from my dining room to a tiny stretch of counter space in my kitchen. 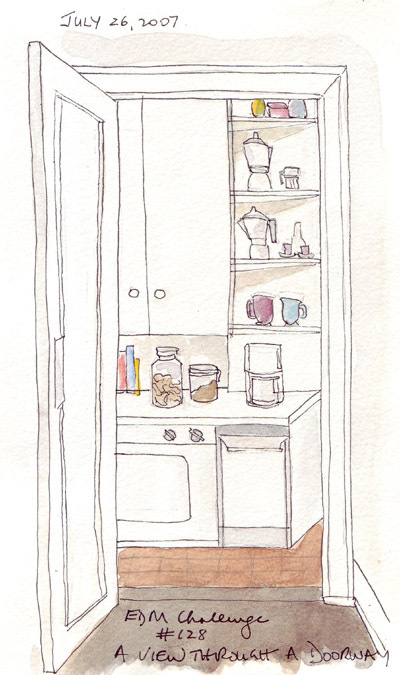 The perspective isn't as wonky as it looks - the counter actually is slanted and there are triangular shelves above it where we keep espresso pots and a few favorite cups. Our coffee pot and cannister of coffee take top billing on this stretch of counter! I really tried sketching my grandson Henry's face in this sketch - done from a photo taken of him just as he turned 3 last summer in London. 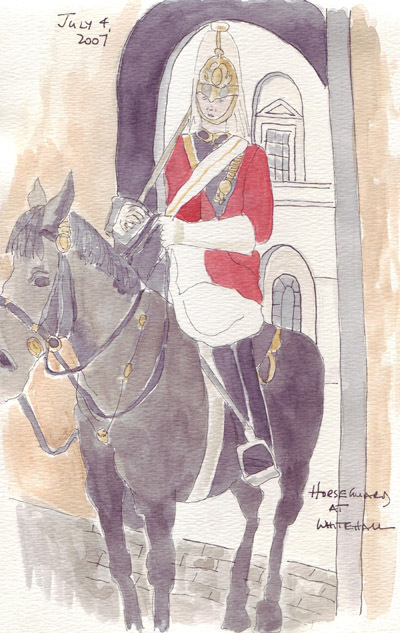 And in spite of my efforts to improve figure/face sketching in 2007 - it was scarey! I think I might have been able to add a generic face, but I'm going to stay away from people that I know and love for now. The next photo in the sequence has him winding up, leg raised like a real major league pitcher ,to throw the ball. Baseball is big in their house! 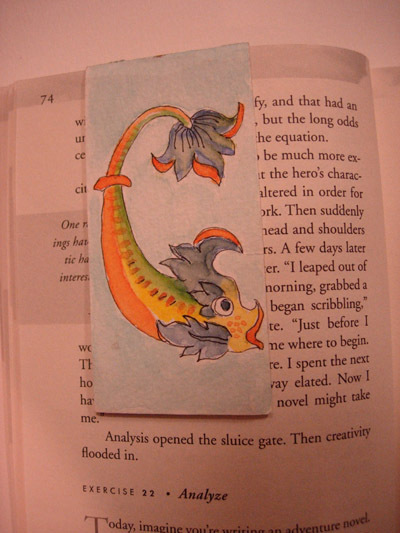 I told Lynn that I make magnetic watercolor bookmarks and offered to upload some photos. Most that I made were given away - these are the 3 that are actively saving places in the books that I am reading. This is how they fit over a page when the magnet holds the bookmark in place and a scan of the magnet side of the bookmark on the right. I cut the magnetic strips just slightly narrower than the width of the bookmark. Here are the designs on the right side of the bookmark - which are folded in half after painting. I use 140 lb cold press watercolor paper and Winsor-Newton watercolor paints. On the back side I glue on cut pieces of a self-adhesive magnetic strip as depicted above. The final size of the cut paper for these 3 is 1 3/4 by 7 1/2 inches. There were several empty pages at the end of my 3rd London sketchbook so I decided to work from photos to fill the journal. Horseguard: We finally walked by the Horseguards on Whitehall one of our last days in London and I was able to take a quick photo amid the crowds all having their pictures taken standing next to the horse. Duke of York Square Sculpture: There are actually two pupils as separate sculptures. 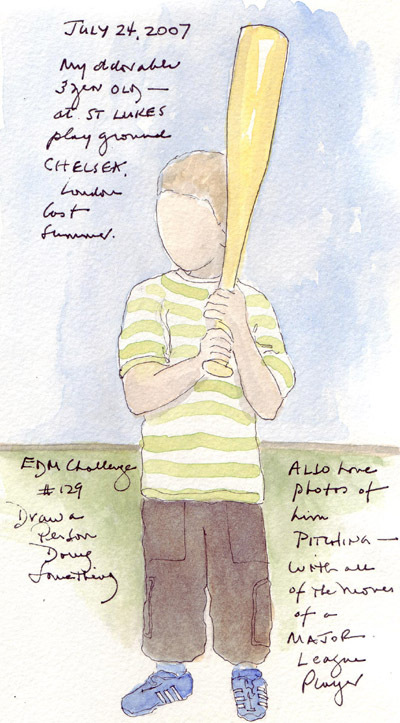 I loved the boy leaping over the bollard and didn't especially like the girl sitting on a bench watching him, so I only sketched him. 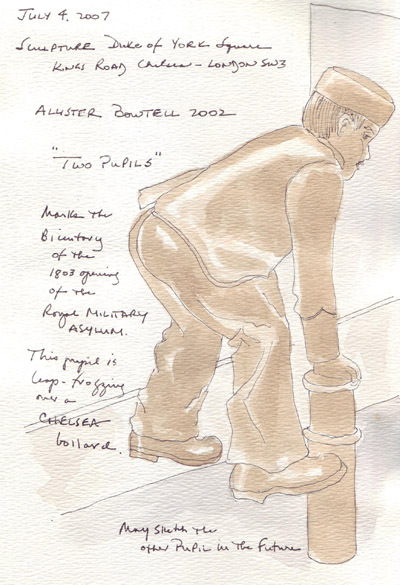 This piece by Allister Bowtell was commisioned in 2003 for the bicentennial of the Royal Military Asylum. We walked by it every time we walked to Sloane Square, making it an important memory of our year-long visit in Chelsea. 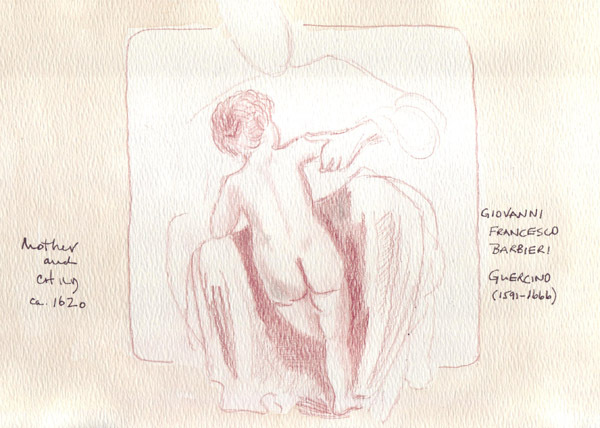 I loved this drawing of Geurcino's at the Courtauld exhibit and copied it to create a two page spread at the very end of Journal #3 - the drawing on the left page and Callum's birth announcement on the right page. His birth in London in December was one of the highlights of the year for everyone. I went back to the Metropolitan Museum of Art Paul Poiret fashion exhibit again yesterday with out of town friends. These garments were from the first several decades of the 20th century, but avant garde for their times and still wearble. 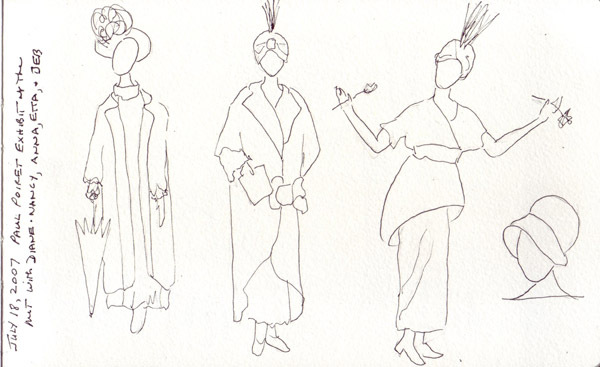 The hats were fantastic and rarely seen today, so I chose to sketch the mannequins with the best hats. I'm still trying to do fast loose, figure sketches, so this was a perfect journal page for the day. When I saw the exhibit for the first time I carefully recorded colors and painted the sketch when I got home. Yesterday I didn't have time to really look at colors, so I'm leaving these as line drawings.